THE HEROESONLINE BLOG | NEW ITEMS ADDED TO OUR WEB STORE! NEW ITEMS ADDED TO OUR WEB STORE! Check out all the new items available in our online store! 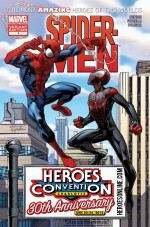 If you missed these things at HeroesCon 2012 now is your chance to get them! 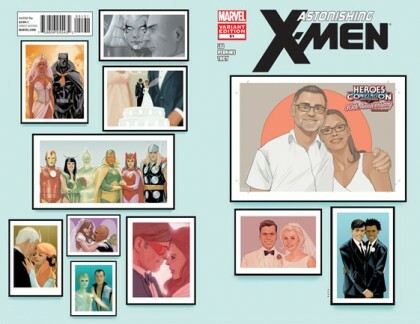 Phil Noto was kind enough to create an image of Heroes owner Shelton Drum and his wife Linda for our very special Astonishing X-Men #51 variant cover. The image was professionally printed on label stock and placed on the blank area of the cover. Ultra-rare HeroesCon 2012 variant of Adventure Time #5! This striking image of Finn and Jake went viral when it was posted online a few weeks before HeroesCon 2012. Now you can own it! Adventure Time #5 also features a guest story by Paul Pope! Only 500 on the planet! 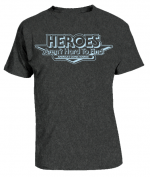 Heroes logo 1 color (pale blue) screenprint on a dark grey heather, tri-blend t-shirt. This shirt is so soft you won’t want to take it off! Any chance you guys will put up the Love and Rockets shirts from the con on the store anytime soon? ← DIG THESE INDIE ISLAND TREASURES!